Make sure to test the SYNC system’s Bluetooth pairing with your phone before you buy. Some phones will not connect; you’ll have to upgrade or miss out on a centerpiece of the Flex’s in-the-now appeal. A singular look, along with top-shelf turbo power and features, earns the 2011 Ford Flex our top score among utility vehicles. The 2011 Ford Flex has angled its way into a rare phenomenon. 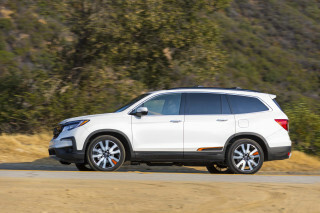 Sales are increasing as it enters its third model year and as more SUV and wagon shoppers realize the square-jawed crossover is one of the best-riding, quickest vehicles available. If the Flex’s collection of rectangles took you a while to warm to, you’re forgiven. It honestly doesn’t look like anything else on the showroom floor, save for a passing resemblance to a Range Rover. The cues are concept-car pure outside, with a rich-looking cabin standard on even the base $29,000 Flex. Borrowing from the MINI playbook, Ford lets you choose the roof color, mirror finishes, bigger wheels, and even a houndstooth-plaid interior. It’s as American as an old Ford Fairline, but Chanel-smart. The Flex is among the safest vehicles you can buy—and once it’s loaded with the new Titanium package, it’s every bit as luxurious as a Lincoln MKT, which shares all its running gear. 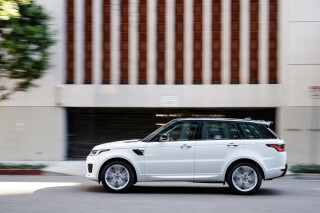 It outpaces even the Range Rover with e-gear like real-time traffic and movie times, an in-car refrigerator, and second-row footrests for your most important passengers. It may sticker at an oxygen-free $55,000, but the Flex Platinum is missing only exotica like night vision and in-car satellite TV in its quest to out-feature every family car on the road. 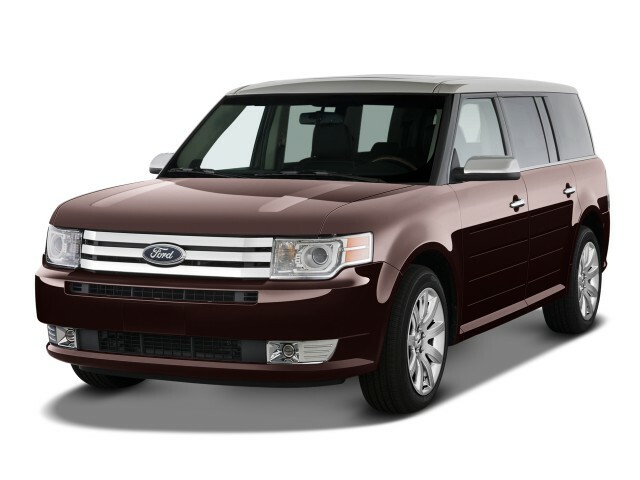 The 2011 Ford Flex tees up a square-jawed, all-American style straight out of a high-end catalogue. Looking for a styling statement in your next family vehicle? Nothing on the road looks like the 2011 Ford Flex. Period. Borrowing cues from concept vehicles to the Land Rover Range Rover and even the MINI Cooper, the Flex has only grown better-looking to us. The details stamped into its tailgate and doors, the hereditary wagon charm, and the slab-sidedness all knit together in a shape that’s decidedly anti-minivan. Adding to the charm are touches and frills lifted from the MINI playbook; you can order a brushed-metal tailgate, a white roof and mirrors, chrome trim, or a new Titanium package that darkens the chrome and wears a distinct front bumper, along with blackout treatment for side pillars. Substance hangs with style inside the Flex, too. The instrument panel sits low and the gauges glow with a blue tint—and the cup holders in soft red. The controls are grouped easily and logically. Like the exterior, the interior comes in a wide range of choices, so you can opt for a handsome houndstooth check on the seats or rich leather to go with wood grain or metallic trim on the dash. A round analog clock on the dash of the navigation-equipped Flex clearly pays homage to the MINI—down to the stamped-in ribs that flank it. The base Flex gives you a taste of handling goodness; the turbo V-6 version tosses in all that horsepower and a tight, composed feel. Given the choice and the bank balance, we’d opt for the turbocharged Flex. However, if you’ve driven a minivan or even one of GM’s crossovers, you won’t be bereaved with the normally aspirated V-6 in this crossover. The base engine is a 262-horsepower, 3.5-liter V-6 that’s also found in other Ford products, from the Taurus to the Lincoln MKS and MKT. While it’s not awesomely fast, it’s more than capable of hitting freeway speeds with a full load of passengers without causing concern. 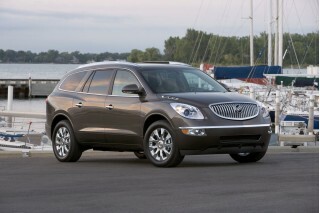 It’s also a bit smoother than the powertrains in GM’s crossovers, on a par with the Honda Pilot’s warmly received V-6. This base engine pairs with a six-speed automatic and can be ordered with all-wheel drive, which adds to the Flex’s already hefty 4,600-pound curb weight. The clear winner—in power and in high price—is the turbocharged version of the same engine, which belongs to Ford’s EcoBoost family of powerplants. Teamed to the same six-speed automatic, here with paddle shifters, the turbo V-6 is powerful enough to overcome standard all-wheel drive and six other passengers to give the driver a real performance rush. With 355 horsepower, the EcoBoost Flex delivers more horsepower than any direct competitor and puts out nearly as much grunt as a V-8 Mercedes-Benz M-Class. Ford promises V-8 power with V-6 displacement and it delivers—and the turbo engine may cost substantially more (at least $37,000), but it doesn’t exact a huge fuel-economy penalty. It’s EPA-rated at 16/22 mpg, with the base engine a tick or two higher at 17/24 mpg. 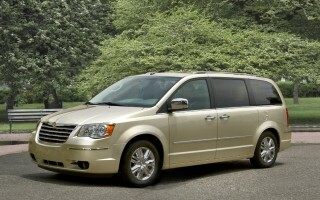 The Flex’s delightful ride quality and good steering encourage full use of all that power. Even in the base version, the Flex comports itself like a smaller station wagon, with fairly crisp steering feel and a compliant ride that only gets boundy if you hustle the Flex into deep, tight corners. It’s a big vehicle, but has more enticing moves than any RAV4 or Traverse we’ve driven. The 2011 Ford Flex puts adult comfort ahead of best-on-paper numbers—and its attention to detail shows. The 2010 Ford Flex has crisp styling and a strong powertrain, but its killer application is its ability to haul seven passengers in comfort. While the Honda Pilot seems configured to seat eight passengers, and the Chevy Traverse packaged to hold the most stuff, the Ford Flex is clearly organized to carry adults in maximum comfort, with a bit less room for kids and cargo. The Flex is 5 inches shorter than the 205-inch-long Traverse and 10 inches longer than the Honda Pilot—but its wheelbase is just about as long as that of the Traverse. That wheelbase translates into lots of legroom for the front two rows of passengers—more than in the Pilot, more than in the Traverse. Up front, wide and cozy chairs are nearly perfect, with just Ford’s obtrusive active headrests spoiling perfect posture. (Ford’s working on a better solution, but shifts the headrests slightly forward to preserve crash-test scores.) The second-row seats are the real thrones here, with so much legroom and headroom, you could knight a peasant at your feet—or just flip out some handy footrests for an aircraft-style seating position. In the third-row seat, the Flex’s passengers will be a little less comfortable. It outpoints other three-row crossovers on legroom, but the Flex is much narrower than either the Pilot or the Traverse here. Still, two adults will find enough room to sit in the wayback for surprising amounts of time. As for cargo, the Flex isn’t quite the hauler the Traverse is—its 83 cubic feet of space behind the front-row seats are 4 fewer than the Pilot, and 20 fewer than the Traverse. It does have more room behind its third-row seat than the Pilot, though—and the Flex’s second- and third-row seats are offered with power-folding controls. Bucket seats are its forte, but the Flex’s fit and finish are its secret trump card. The materials, and the way they work together, are a step up for Ford—the door panels have faux-wood trim, metallic bands, leather, and plastic all next to each other, and they come off as high-quality pieces, rather than cheesy imitations. There is some hard gray plastic, banished to places where hands don’t usually touch, but the Flex’s cabin is so much richer than either the Traverse or Pilot, you’ll probably want to compare it against a Range Rover Sport to spot its few flaws. 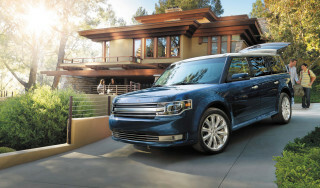 The IIHS and NHTSA agree: The 2011 Ford Flex is among the safest vehicles on the road. You can’t find a vehicle safer than the Ford Flex, according to the government and the insurance industry. The 2011 Flex has been chosen as a Top Safety Pick by the Insurance Institute for Highway Safety (IIHS), receiving the top ratings of "good" for both frontal offset and side impact collisions. The National Highway Traffic Safety Administration (NHTSA) gives the Flex equally strong scores, rating it at five stars for both driver and passenger protection, and at four stars for rollover protection. The Flex's comprehensive set of safety features includes six airbags, anti-lock brakes, and stability control with anti-rollover technology. A rearview camera and parking sensors are available, as are a blind-spot warning system and adaptive cruise control. Ford added its MyKey system to the Flex in the 2010 model year, and it’s back for 2011. MyKey allows parents of teenage drivers to set limits on the Flex’s top speed, stereo volume, and other entertainment features, while keeping systems like traction and stability control enabled. The 2011 Ford Flex was born to entertain—but even base versions will keep multitasking families happy. The 2011 Ford Flex’s full array of common-sense standard features and gee-whiz options has put other crossovers on point. No other seven-passenger crossover comes close to its available features; only the five-passenger 2011 Jeep Grand Cherokee is in the running, with its in-car satellite TV. Even the basic Flex has an ample standard-features list. On it are third-row seating; an AM/FM/CD player; power windows, locks, and mirrors; a capless fuel-filler system, which means no more misplaced gas caps; and Ford’s MyKey system. The upmarket versions add the turbocharged engine, all-wheel drive and other niceties like a leather interior; a panoramic sunroof; and Ford’s SYNC entertainment/phone controller. Among the more engaging options are Sirius TravelLink, with real-time traffic, weather, sports, and movie listings; pricey Sony sound systems; a DVD entertainment system; 20-inch wheels; a second-row refrigerator; a hidden keyless entry pad that responds to a swipe of a finger like the Apple iPhone; a power tailgate; xenon headlamps; and HD radio. 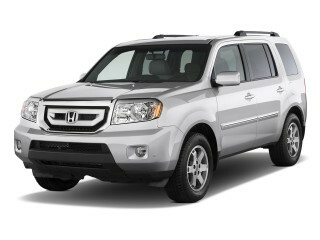 New for the 2011 model year is a Titanium package with distinct styling pieces and colors. 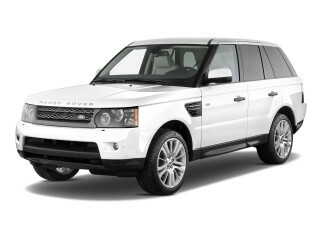 It also includes a two-tone roof, black-chrome trim, 20-inch wheels, suede and leather seats, and HD Radio. Fuel economy isn't the best in class on the EcoBoost models, but for a seven-person vehicle, the Flex does well enough. With EPA fuel economy ratings of 16 or 17 in the city and 21 to 24 on the highway, the 2011 Ford Flex isn't very fuel-efficient--even when compared to some hefty body-on-frame SUVs. Those numbers do look a bit better, however, when you figure that this vehicle can carry six adults comfortably. The available EcoBoost doesn't make the Flex any more economical or ecological compared to the base engine, but it does allow faster acceleration without the need to offer (or option up to) a thirstier V-8. Maybe it's my heavy foot for fuel economy, faux leather checking ( cracking ) for quality ssues. Super well designed utility vehicle. The comfort and quiet of a much more expensive car. With folding down the third row seats we can carry my disability scooter with room for a mounted power lift for loading and removal, and still has seating... The comfort and quiet of a much more expensive car. With folding down the third row seats we can carry my disability scooter with room for a mounted power lift for loading and removal, and still has seating for five adults. Looking for a different year of the Ford Flex?